Dr. Mario music inspired by the Beatles? Just a silly random observation, and also a test of my ability to write one of these posts mostly using my cell phone. 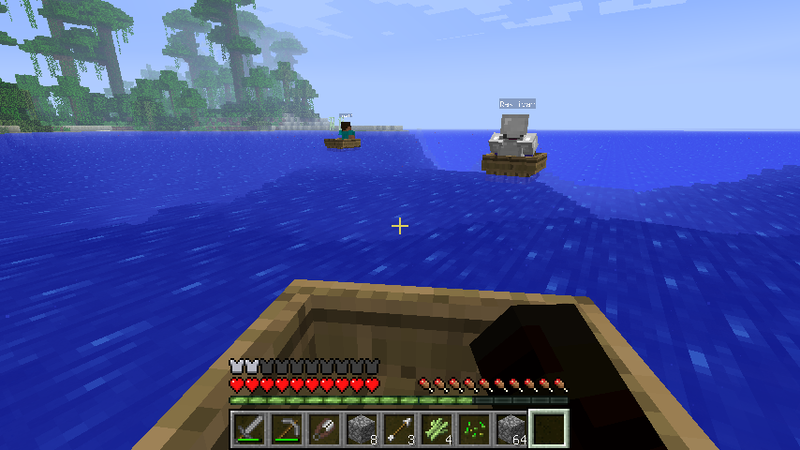 The original game had only two tunes to use as background music. I recently realized that this music sounds a lot like the song “Lady Madonna” by the Beatles! The two tunes are different enough that it’s not an exact copy, but I think the inspiration had to be there. Technology to help the faceblind? That’s certainly what I would do with it! It could also help with executive dysfunction by providing a framework for keeping an organized schedule, kind of like how the guy in the commercial uses it as a dayplanner. I truly believe that the technology of the Internet has been and can be a tremendous help to people with Asperger’s if it’s used wisely. 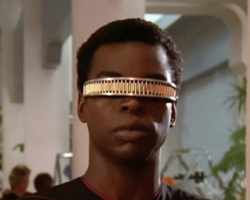 Did Google make Geordi's VISOR? 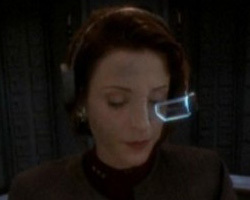 Major Kira tests another Google prototype? Of more concern is the fact that other people would have the advantage of using this information too. A salesman could use it and say, “Oh, here comes a guy named Nathan; my records say he just visited a Star Trek site. I’ll try to sell him my Star Trek DVDs.” That would be annoying. Even more likely is that Google could sell ad space, so if I used this as my dayplanner, it would be yet another way to advertise, this time literally right in my face! The commercial, after all, is not just targeting ukelele-playing boyfriends– it is also catching the notice of businesses like the bookstore, the concert promoter, and the coffee truck, which all get business from the guy in the commercial thanks to Google’s invention. It’s also interesting to ponder how such a device could affect the way people think. One commenter on the news article announcing this project said something like “Goodbye spontaneity.” It’s true– what might seem freeing to people who struggle with organization and socializing could be very restricting to people who are social by nature. And if you have a guide to help do something for you, it might cause you to stop exercising the muscle (or in this case, mental facility) that allows you to do it yourself. The idea is a little amusing to me– could reliance on technology like this make everyone think a little more like an Aspie?